The most basic definition of a photovoltaic solar shingle is a solar panel that is configured as a roof shingle that is integrated into a conventional asphalt type shingle roof. Recent advances in the efficiency of solar shingles or tiles have also led to the development of solar shingles that will integrate into shake, concrete, tile and slate roofs as well. They look a lot like a normal asphalt type shingle and protect your roof from rain like a conventional shingle but have the added bonus of being able to convert solar energy into electrical energy for your home. What Types of Solar Shingles Are There? There are currently two basic types of photovoltaic solar shingles used to produce home solar power. Traditional silicon solar cells and the newly developed copper-indium-gallium-selenide (CIGS) thin film photovoltaics. 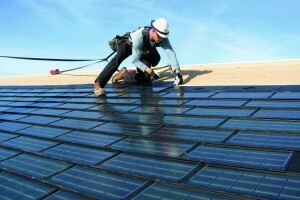 Silicon solar shingles are very much like a traditional solar panel. They are rigid and in a frame yet made thin and proportional to conventional roofing materials and are installed in line with existing roofing materials. CIGS photovoltaic roof shingles utilize the newest thin film technology for producing home solar power. CIGS are able to be made into more flexible and lighter weight shingles that are able to blend into an existing or new roof. Although the solar shingle industry is still very young, the first were produced in 2005, continued improvement and growth is guaranteed. The two leading sources for photovoltaic roof shingles in the United States are Dow and Certainteed. More information on each specific type of solar shingle can be found on their websites. Why Solar Shingles Instead of Solar Panels? 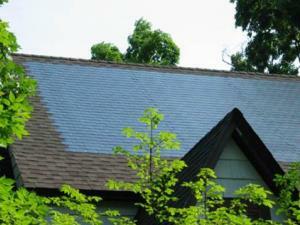 The biggest reason people use solar shingles rather than solar panels is a matter of aesthetics. Solar shingles appear more like a conventional roof which some people prefer over a roof mounted solar panel that is installed on a mounting system that is typically elevated off of the roof surface. In some cases, a home owners association (HOA) or community governance group may demand a consistent look to all homes and might consider the look of roof top solar panels to be unacceptable, in such a situation a solar shingle system would probably be an acceptable compromise. It is worth noting here that there are some areas in the U.S. that have legislated free and equal access to solar energy. A qualified solar advisor can help you understand any solar access rights you may have in your area regardless of HOA or community rules. Solar shingles are installed in place of conventional shingles and therefore are subject to the orientation of your roof. Roofs are not built to maximize solar exposure or photovoltaic efficiency which can reduce the amount of electricity produced by your roof top solar system. This lack of efficiency can be overcome by increasing the size of the area covered with solar shingles. Unfortunately, increased coverage also increases cost as well as lessening of aesthetic gains. Traditional roof top solar panels can be tilted and aimed to perfectly capture the sun’s energy which leads to smaller area coverage and more efficient power production. Our Solar Specialists are qualified experts who are able to analyze your home, current energy usage, future needs, costs and all rebates or incentives you may qualify for by switching to clean efficient solar power. Signing up for a solar analysis only takes a minute and is completely free of cost and/or obligation.